and browsing publicly shared custom maps of all types. Just look up sunny “Los Angeles” to find the best hiking trails, street art, breweries and more to do in La-La Land. And, for those of you who are actually looking forward to the winter, see what ski options others have recommended, with the maps they created of their favorite slopes and resorts. An insider’s take on the best views and paths of Cahuenga Peak, Los Angeles—including a walk to the Hollywood sign! Once you’re done daydreaming, plan out your own trip with the new My Maps (previously Google Maps Engine Lite), adding images, descriptions, custom icons, and place details along the way. Make sure to download the My Maps Android app so you can also view your map or make a change on the go, or check out others’ maps while you’re on your way. Did you plot out the perfect vacation? Share it publicly so others can get inspired, too—or if you prefer, keep your secret spots safe by setting your map to private or by sharing with a lucky few. With these tools for exploration in hand, you can find and create maps for anything you’re interested in—like a collection of Sherlock Holmes’ famous haunts, or global tributes to Nelson Mandela. The possibilities are pretty much endless—students have photographed and mapped a city’s public art installments, authors have laid out their stories’ locations on the map, and activists have plotted out shelters and distribution centers during emergency situations. If you’ve already been creating custom maps with classic My Maps, today you can upgrade all your content to the new My Maps, and enjoy these new options. You can import spreadsheets, easily include images and YouTube videos, and organize your locations and routes however you want. By the end of this year, all maps created in classic Google Maps will automatically upgrade to the new My Maps, but to get started right away, open up the new My Maps and “Upgrade now,” then check out the tour—found in the settings menu—for tips on creating your own custom content. As temperatures cool down, you might be searching for your next warm vacation spot. 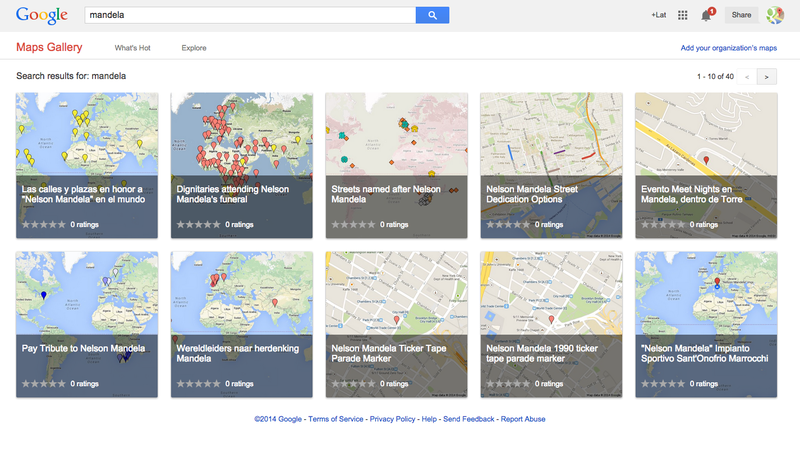 Starting today, you can get a little inspiration by going to Google Maps Gallery and browsing publicly shared custom maps of all types. Just look up sunny “Los Angeles” to find the best hiking trails, street art, breweries and more to do in La-La Land. And, for those of you who are actually looking forward to the winter, see what ski options others have recommended, with the maps they created of their favorite slopes and resorts.